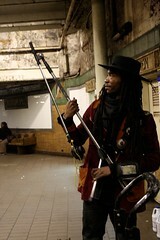 Weary of getting bounced from station to station, Mr. Metalarc began applying to the MTA’s Music Under New York program, which holds yearly auditions and grants members special access to 25 high-traffic areas throughout the transit system, including a mezzanine in the station at 14th Street and Union Square. This year he was given his third rejection notice. Kenan Christiansen Mr. Metalarc during a set. Amy Hausmann, the assistant director of Arts for Transit, explained that each year the program receives about 300 applicants, of which about 30 become full members. 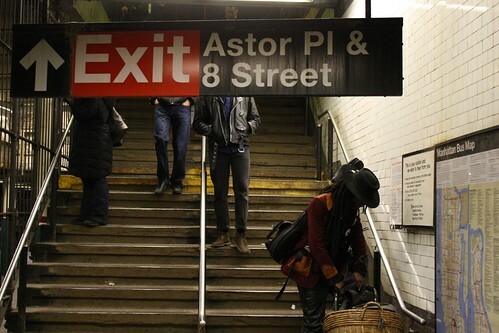 “Musicians are selected based on the quality of music, the variety they add to the group, and based on the appropriateness of their music to the subway environment,” Ms. Hausmann said. She acknowledged that some musicians have to apply multiple years and encouraged artists like Mr. Metalarc to keep trying. But whether he became a member or not, it still would not affect Mr. Metalarc’s right to play at Astor Place. An MTA spokesman confirmed that no sound amplifiers were allowed on subway platforms, except in designated areas, which Astor is not. Mr. Metalarc continues to lament the audition panel’s decision. He feels if there’s one thing he has to offer the city, it’s variety. “This city’s never seen someone like me before,” he said. There’s also the possibility that it may never again. 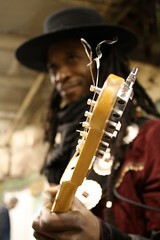 Kenan Christiansen Mr. Metalarc after a set at the Astor Place station.